One really good thing about regular posts is that the pressure is off to create witty titles. I’ll leave that one up to Maia, eh? This week hasn’t been great. This fortnight, really. I am dependant on meds to keep the headaches at bay and continue functioning. I am nowhere near as bad as some people (and freakily there is a shortage of Sumatriptin right now here in NZ, so I am hoarding the 10 tablets I have left and using the other stuff) but I am going to have to have a serious conversation with my boss when he returns from Ambiente next week. Ideally I’d like to work from home Wednesday and use that to catch up on sleep and slide my working day by a few hours. I’m fairly disciplined and there are no regular scheduled meetings for me that day, apart from his catch-up. Say a prayer for me, please? On the Finish front, I have #3 – Crafty Rahenna’s round robin is done, and will be off in the post today. I think that is actually ahead of schedule! There are no beads, as she will add these post a wash (Poppy’s wings need it, they aren’t as white as they could be) and no thread conversions on my part. Mase has begun to stitch again – he is already converting the baseball from this chart to a red cricket ball and made the decision to swap around the two colours in the gridiron ball. Okay, then. I might have started a monster! This is at about an hour of work, and he’s actually done more. Apparently he “needs” his own Instagram as he doesn’t want to continue to use mind. Hmm, really? Need? Backstitch: 2 strands 844 for border & wings, 356 for skin & 310 for lashes. Beads: N in the border 02026 to 03050; O in the border/hair + collar went from 02010 to 00161; tree is all 03050 except the star is 03016; O in the dress is all 02026. On Saturday we escaped the mugginess of the city and went for a tour north of the city. We did Waiwera pools to relax (I want this place, but Ben says 650-700K and I just about choked, so that’s a no https://www.barfoot.co.nz/562286 ) and ended up at Orewa for dinner. There’s a good takeaways on the edge opposite Hillary Square, and we trudged across the road to the beachfront. We drove home via Riverhead (which is where I wanted to live, but now I’m thinking the village vibe is going to disappear in the new subdivisions that are spreading out). Sunday was a bit easier – Sharon’s place, then Arataki, down across town to Devonport (proper lager at the pub, apparently) and home for dinner. Yesterday was recovery day, so Si & his dad chain-sawed pine trees for the gf & grandma to last them a couple of winters, then BBQ at Grandad’s – and no summer Barbie is complete without a game of cricket. See Mase in the front left, in blue? From that spot he threw the ball to the far wicket and ran Zac out. Amazing arm on that kid. Today is the first day all three boys are at school – hallelujah! – so of course I’m celebrating this by being at work. Hmm. Something is wrong with this picture. At least I have Rahenna’s piece to stitch on. By default I’ve ended up with Lily of the Valley, which I haven’t stitched before. Poppy reminds me of Anne, as it was one of her finishes last year. Hey, Anne! another few nights and we will have a finish! Question of the Month: Introduce yourself, your projects, and any goals you have for the year! Well, nothing much has changed since last January. I’m still in the same house, same job, same everything really – only the projects have moved on. We are very nearly done with the SIL’s house reno so that will open up more free time. The Screaming Teen turned 16 on Saturday and has passed the first year of his major exams; Zachary Quack is about to turn 13 & start high school (he has a scholarship, I was so proud I nearly burst) and Mase the Ace is posting his own Lego creations on my Instagram account. This is what you get when you have gifted kids and are stupid enough to use hubby’s new extension number as your cell pin. I am up to the very last panel of a Mirabilia Round Robin – this one belongs to Crafty Rahenna. Then mine will come home! I’m pretty excited as I haven’t even seen an update for nearly a year now. But before I move onto the RR, I want to finish one piece so I have something completed on my #16in2016 list. Cherub with Tree is an older freebie by Nora Corbett, and I started her as a coverage experiment in June or July 2014, before putting her away and focussing on the Audubon St birds that are on the same fabric. She is on 25ct white Lugana, stitched 3 over 2, with 2 strands as the backstitch. I found that the darker threads don’t have as much coverage as the lighter (lots of others have commented the same with DMC) but overall I’m pretty happy with the result. Lots and lots of conversions (hubby chose the dress colours & is really pleased with the outcome). I think maybe another week and this will be done! Mirabilia Mermaids of the Deep. First goal in December was to start the top mermaid and stitch the skin & hair. That took 11 days (altho some days I only put in a couple of threads!) and the next goal will be to complete the DMC in her tail. I had a couple of days in between this one and my #newyearnewmira so I threw Roses of Provence up onto the stand to see if I wanted to add her to the rotation. And yes – she is back in. Mirabilia Raven Queen. My #newyearnewmira start in the FB group. My goal was to complete the border for the top half & get the architecture on the LHS done. I am doing the beads & Kreinik as I go. Next goal is the architecture on the RHS, including the Raven. Nora Corbett Cherub with Tree. The goal was to complete the LHS background and her hair – and that took 3 days so she stayed on the frame. This one will be my second finish for the year! My first is saved for the Smalls check-in later on this week. Mirabilia Roses of Provence. There’s a couple of others doing her as well in their rotations. Next goal is to get the tree and roses done. Beading as I go. Nora Corbett Blitzen. Goal is to get his body and the ribbons that connect him to Rudolph completed. Mirabilia Persephone. Next goal is to get her left arm and the “jellyfish” on the LHS finished. Then it’s onto her dress conversion! Nora Corbett Arezzo. This is my over 1 conversion. Goal is to get the lower pink roses done. I’m toying with using petite beads for the last lot of roses – talk about a glutton for punishment! Semco Toy Story sampler. Next goal is to get the dinosaur done. Teresa Wentzler Tapestry Cat. Next goal is to get the cat body done. In addition I want to do a Small each month and drop in another couple of things – Simon has his eye on the Satsuma St “Pretty Little” series. He’s English, so London is perfect; he’s been to Paris, so that’s an obvious choice and we both love Sydney, so there’s 3. Smalls apart from this month will likely be the Joyful World SAL that I linked to the other week & the Tuscan Garden will replace Cherub as a Mini (my thought pattern is Small (Ornament)/Mini/Medium (a Nora Corbett size)/Large (a proper Mira size)/Yep That’s Big (Teresa Wentzler)/Absolutely Freaking Not No Way (HAED equivalent)). 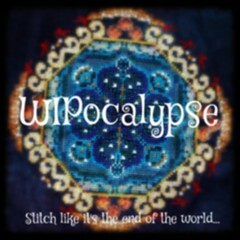 Looking forward to reading some of the other WIPocalypse posts – jump on in! I almost forgot to post! Head down, tail up at work and (mostly) at home, I am still not reading much and writing even less, with the exception of Board reports. Which are boring. Unless of course you want to know more about the good/better/best matrix and how that is affecting sales? Yeah, thought not. Anyways, I still haven’t got Rahenna’s round robin from Jacqui and I’m getting quite concerned. Not sure what to do – a RR going missing in the last round is rough. I KNOW as I still don’t have mine, and that was from another Auckland address. I’m kind-of scared that this will mean that I won’t be in any more international RRs and that makes me sad. I’m working on Cherub with Tree. So many threads now have been converted, I have notes all over my working copy (a plus that I don’t know a PDF would keep up with on my tablet). I’ve worked out how to stitch and watch Netflix or Flosstube – blu-tak! – and the only frogging I did was colour related. Si has picked out the blues for her dress and is waiting for me to start – but I am about 20 stitches away from completing her wings and I want to get that nailed first. Not that much further to go! Then I’ll have a second finish (the ornament just needs making up but you can wait until the Smalls check-in to see that). I also found some large book rings – perfect for the BAP quantities of bobbins! This is Persephone’s, minus the dress…pretty! After last week (some work frustrations & a migraine) I wanted to hole up all weekend. So I did. I only went out for the essentials (groceries) and enjoyed that feeling of being left alone. Or as alone as you can be with four males in the house. I am beginning to think that I made my rotation goals too small. It took only 11 stitching days to get to the RP point for Mermaids of the Deep Blue and 7 for Raven Queen (updated images are on my WIP page). That just doesn’t seem long enough but it does mean I am not disliking any piece when I put it away. I’m not sure yet what I will do with the larger pieces. I put the 2004 Cherub onto the scrolls on Saturday afternoon and was at that goal by dinner Sunday (to have the LHS background & her hair done, excluding Kreinik & beads) – so I’m going to work on her until finished, or Jaime’s RR piece arrives from Jacqui (whichever comes first). Being a bit more disciplined has meant that this piece has gone from hovering on the border of becoming a UFO to potentially my first finish in 2016. Plus there are a lot of thread conversions going on. If you would like to stitch this chart, you can find it HERE I will post my conversion details later on, once it’s all sorted. This is Little House Needlework’s Gourmet Garden. I’m going to convert the threads to a mix of DMC blends and have a really good play with it. I have a little baby blue lavender that I will use as a template for the two larger stems, and I’ll use some buttons instead of the white hearts down the centre. And probably re-watch the Branagh version of Much Ado as this design reminds me of the scenery in that film. Which has Keanu Reeves in it for additional scenery bonus. And the script is so so close to the original Shakespeare, even more bonus! TRAILER if you haven’t seen it, I highly recommend it. I will probably give this chart away once I’ve completed it – but that may not be for a few months, depending on how adult I stay. I’ll have to think of a competition question to go with that post! Theme: Recap your accomplishments for the year! Nora Corbett Reindeer (I started with Rudolph). I only have five charts more to go…six to buy DIDN’T BUY ANYMORE, RESEARCHED & FOUND OUT SHE’S ONLY CHARTED NINE IN TOTAL. RUDOLPH COMPLETED, BLITZEN STARTED. 2015 ended up being the year of the Round Robin. I have stitched in 6 Mira pieces and 5 local pieces – and got burned as the person who last stitched mine has gone AWOL and not bothered to return emails, phone messages or facebook messages so that’s really disappointing. Then there was the “friend” who lied repeatedly to me & shook me up. April’s piece – only Rahenna & Lenna to go and it looks gorgeous. Keely’s piece is nearly done! On the other side of the fence there are some amazing people out there. The stand Andie gave me is so so awesome and really helped me stitch thru carpel tunnel. 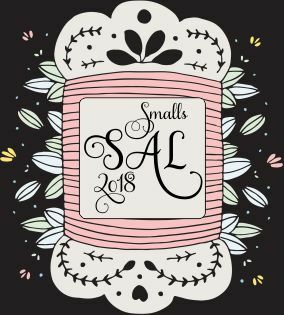 Others are full of encouragement – Mel (who runs WIPocalypse), Anne (Feather Stiching), Erin (Crossstichery), my fellow Mira RR stitchers, the Instagram bunch and many, many more. Here’s to all of you! Thank you for following along with my WIPocalypse journey. I hope you’re inspired to jump on in this year!